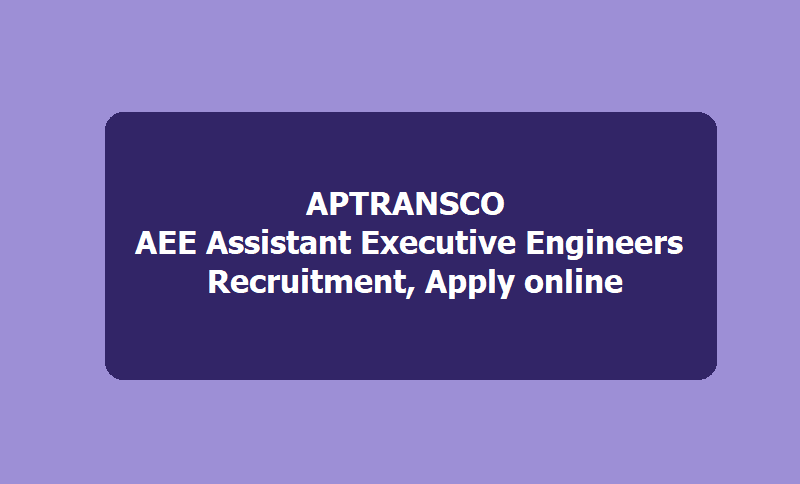 APTRANSCO AEE Assistant Executive Engineers recruitment 2019 Apply online: Online application form, last date for apply, hall tickets, results, selection list and more details are available @ http://www.aptransco.gov.in/transco/, APTRANSCO has released the AEE Assistant Executive Engineer Posts 2019 Recruitment Notification on February 05, 2019 and Transmission Corporation of Andhra Pradesh Limited (APTRANSCO) invites #onlineapplications from the eligible and qualified candidates for the post of AEE Assistant Executive Engineers(Electrical). About: The erstwhile Andhra Pradesh State Electricity Board which came into existence in 1959 was responsible for Generation, Transmission, and Distribution of Electricity.Under Electricity Sector Reforms agenda, Government of Andhra Pradesh promulgated Andhra Pradesh Electricity Reforms Act,1998.The erstwhile APSEB was unbundled into one Generating Company (APGENCO), One Transmission Company(APTRANSCO) and Four Distribution Companies (APDISCOMs) as part of the reform process. APTRANSCO came into existence on 1.02.1999.From Feb 1999 to June 2005 APTRANSCO remained as a Single buyer in the state-Purchasing power from various Generators and selling it to DISCOMs in accordance with the terms and conditions of the individual PPAs at Bulk Supply Tariff(BST) rates. Subsequently, in accordance with the Third Transfer Scheme notified by GOAP, APTRANSCO ceased to do power trading and has retained powers of controlling system operations of Power Transmission. Applicants must possess the qualifications from a recognized University as detailed below or equivalent thereto, as specified in the relevant Service Rules of APTRANSCO as on the date of Notification.